5268 ✉ 5,DR53 3 Pfg. 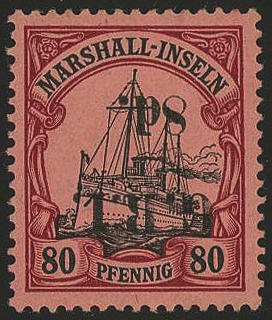 Imperial yacht in rare mixed franking with German Reich 2 Pfg. Germania, in perfect condition on picture postcard with single circle postmark \"TSINGTAU KIAUTSCHOU 7.3.03\" to Weissenburg / Alsace with arrival postmark. 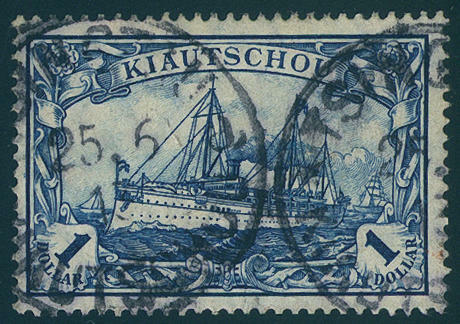 Mixed frankings between Kiautschou and the German Reich are general rare. In combination with the 2 Pfg. Are only a few copies became known, because these denomination value to the Post offices not in stock was. An especially attractive and rare card! 5269 ✉ 10 30 Pfg. 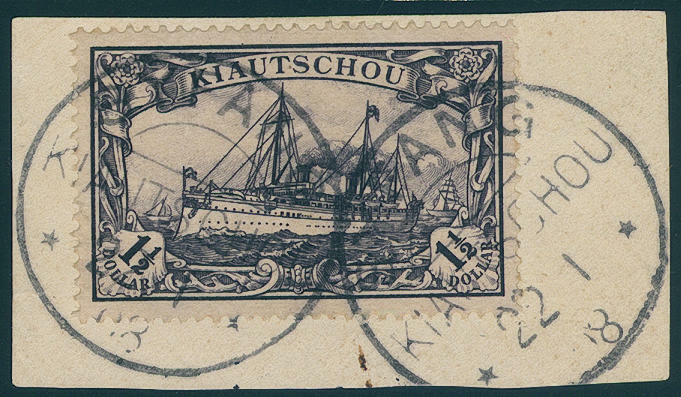 Imperial yacht in double postage with China 4 C. And 10 C. Coiling Dragons on registered postcard to Frankfurt. The card was in \"TSINANFU 20.6.04. \" written and in the outback from Kiautschou within a Chinese post office mailed. There was the card with the corresponding registered stamp of the Chinese post officees provided and with the so-called Lunar-Dater. The postage for this was 4 C. For the card and 10 C. For the registered postage. There Chinese stamps only domestically valid samples, was for the foreign postage the 30 Pfg. 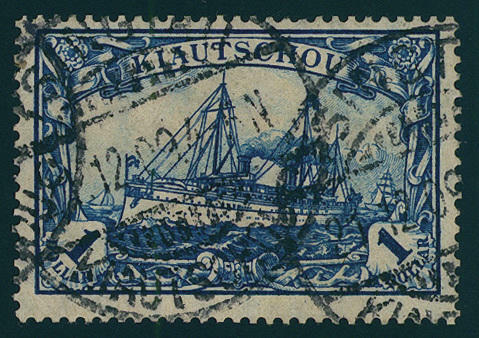 From Kiautschou franked. Therefore was the document the German post office hand over and with the registration label and single circle postmark \"TSINGTAU 24.6.07\" provided. 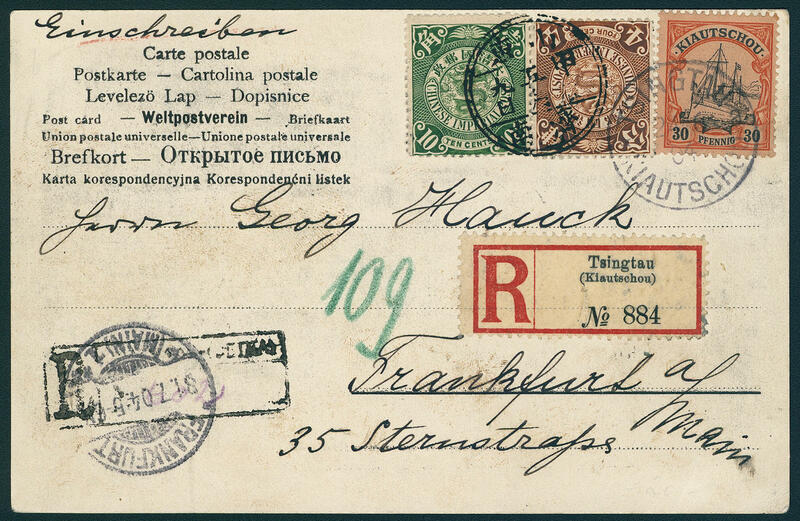 From there the card was transported to Frankfurt and stamped with an arrival stamp. A wonderful fresh and particularly beautiful double postage. Only very few registered cards have become known in this form! 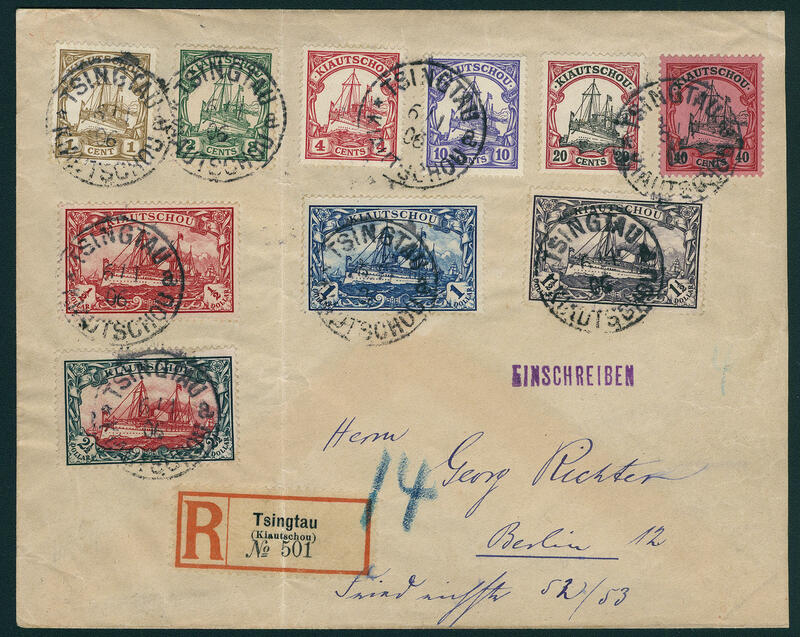 5270 ✉ 18/27B Imperial yacht 1915, all 10 values as spectacular set franking on gef. 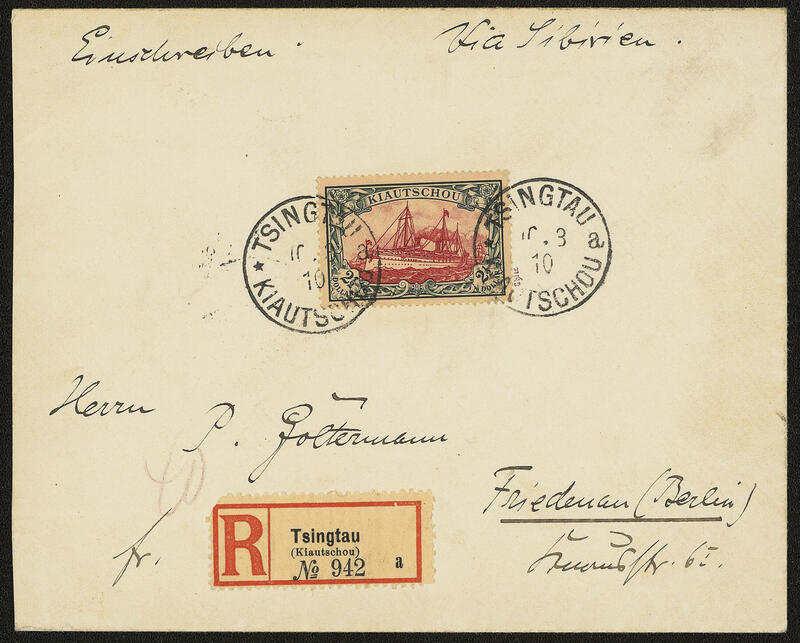 Registered cover with single circle postmark \"TSINGTAU 6.1.06. 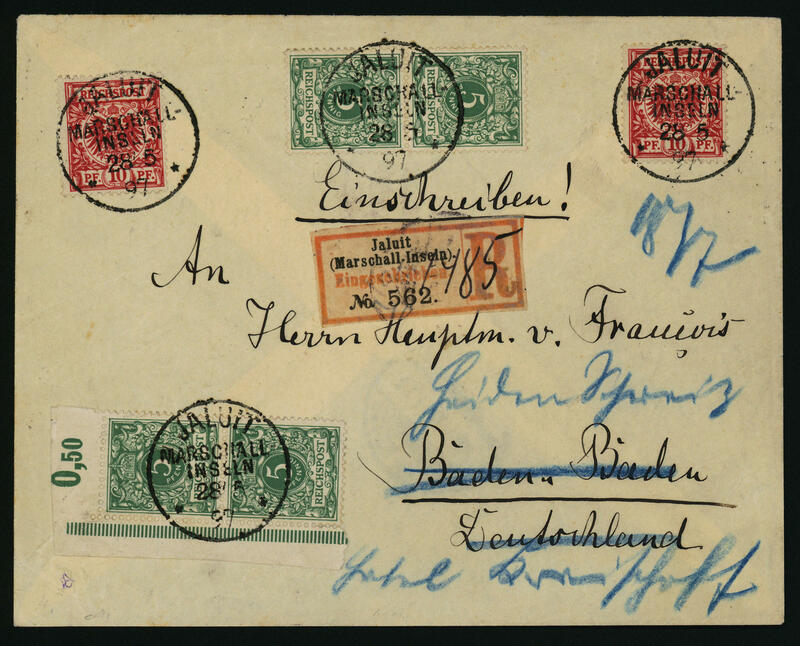 \" to Berlin, 1 C. And 1 ½ Dollar a perf shortened. 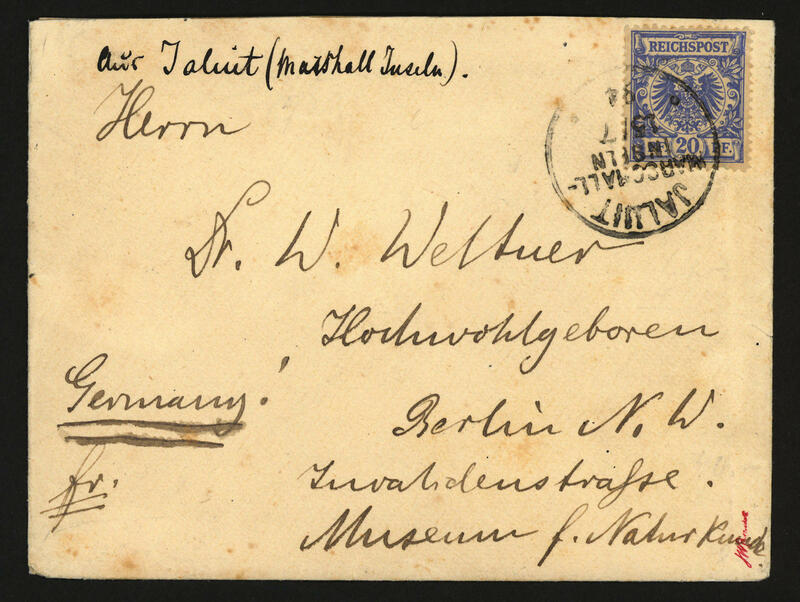 The cover is to the known stamp expert Georg Richter sent with arrival postmark on the back. There are only few set frankings of this issue have been preserved! Photo expertize Jäschke-Lantelme BPP. Michel 8900,- €. 5271 ⊙ 25I 1 Dollar imperial yacht unwatermarked, with plate flaw \"numeral of value 1 crosswise hatched\", fresh colors and neat cancelled \"TSINGTAU 25.6.13. \". Michel 800,- €. 5272 ∆ 26A 1 ½ Dollar black violet unwatermarked, fresh colors and in perfect condition on wonderful white letter piece with two clearly postmarks \"SYFANG 22.1.08. \". Connoisseurs piece for the highest standards! Photo expertize \"faultless condition\" Jäschke-Lantelme BPP. Michel 2000,- €. 5273 27A 2 ½ Dollar green black / dark carmine, 26:17 perforation holes, unwatermarked, fresh colors and well perforated, in perfect condition mint never hinged without any signs. An especially nice copy this colonial rarity for the highest standards! Photo expertize \"faultless mint never hinged condition\" Jäschke-Lantelme BPP. 5276 ⊙ 27A 2 ½ Dollar green black / red unwatermarked, scarce perforation 26:17 perforation holes, fresh colors and very well perforated, neat and clear used \"TSINGTAU 18.10.05. \". An especially nice copy this colonial rarity in perfect condition! Photo expertize Steuer BPP. 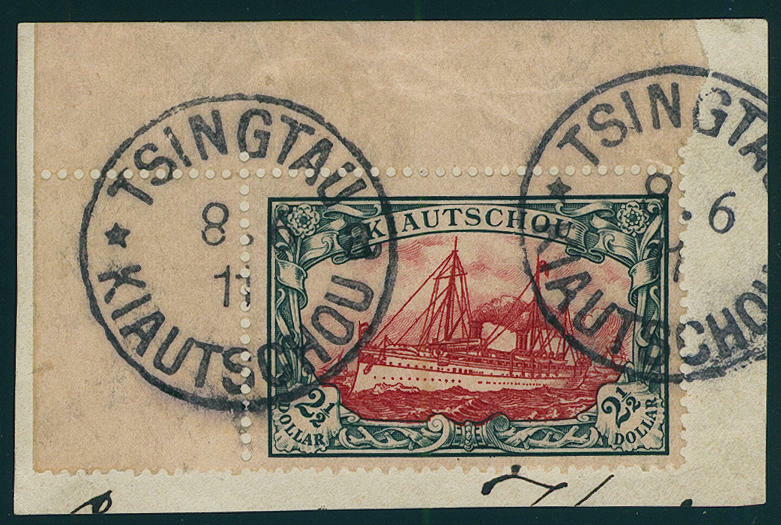 5277 ∆ 27B 2 ½ Dollar ships unwatermarked, 25:16 perforation holes, from right margin of sheet with marker cross on margin to facilitate cutting or perforating of panes, fresh colors and well perforated on beautiful letter piece with clean mounted single circle postmark \"TSINGTAU 18.9.06. \". A very nice copy this colonial rarity! Photo expertize \"faultless condition\" Jäschke-Lantelme BPP. 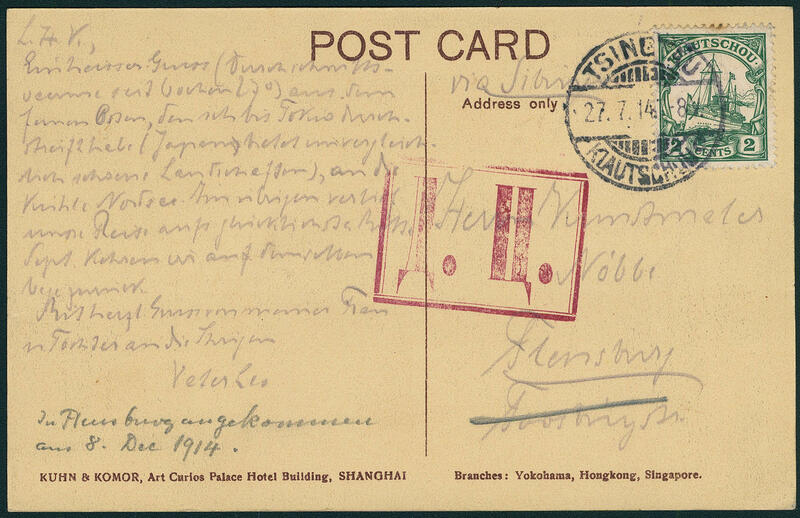 5278 ✉ 29 2 C. Imperial yacht as correctly franked single franking on commercially related picture postcard \"SHANGHAI NANKING ROAD\" with neat postmark \"TSINGTAU KIAUTSCHOU 27.7.14. 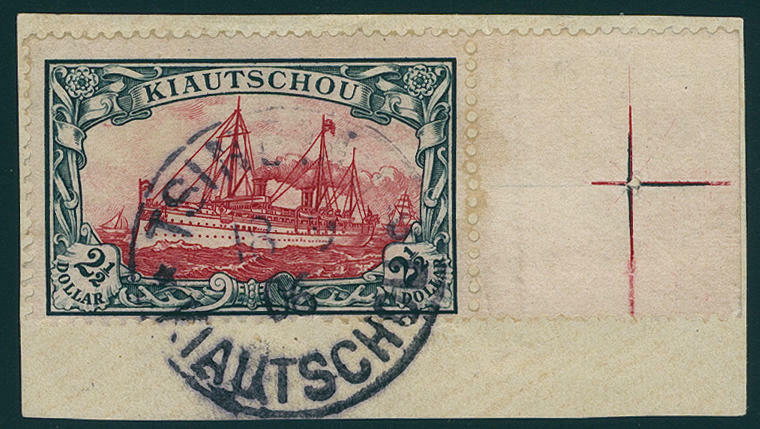 \" to Flensburg over Siberia transported with very scarce Russian censorship stamp in violet, which here exceptional clear mounted is. An impressive and scarce war postcard! 5279 29aU 2 cents imperial yacht 1905 unperforated in the horizontal pair from upper margin with seal stamp the Empire printing office in violet \"operating battalion Empire printing office\", fresh colors and with wide margins, in perfect condition mint never hinged in utterly perfect condition. From of this variety was a sheet from the archive the Federal Printing Office 1997 auctioned. Only this here offered pair carried the seal stamp the Empire printing office. Unique rarity of the German colonies in utterly perfect condition for the highest standards! Photo expertize Steuer BPP. 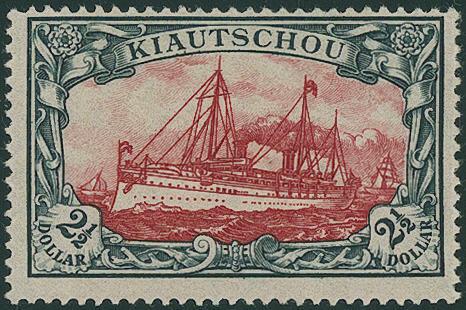 5280 ✉ 30 4 C. Rose, fresh colors and in perfect condition on very nice card with clear single circle postmark \"TSINGTAU KIAUTSCHOU 15.9.14. \" to Tientsin with very scarce large Gouvernements censorship stamp. 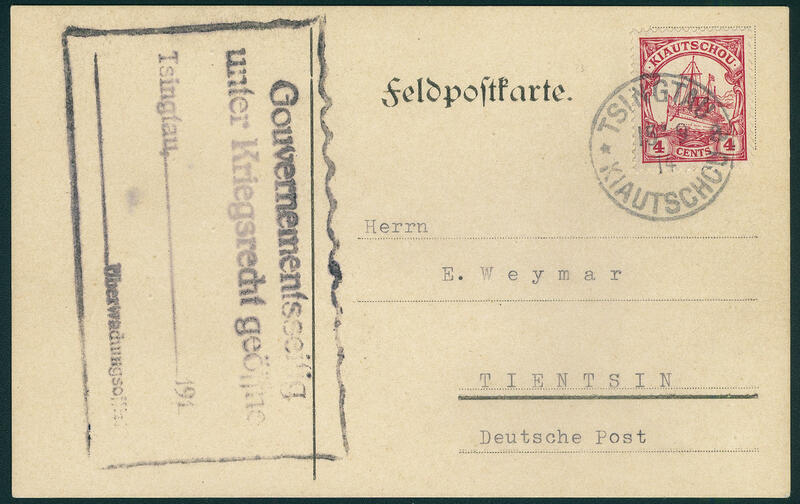 The here offered card comes from Paul Meyer, an engaged of the imperial German post office Tsingtau and was with a the last possible postal uses transported. This happened with a Gouvernements pinace about the back-up area Taputur. A significant war mails rarity in exceptional quality! Photo expertize Dr. Steuer. 5281 ⊙ 35IAI 1 Dollar blackish blue, peace printing, 26:17 perforation holes, very scarce retouching \"numeral of value 1 crosswise hatched\", fresh colors and very well perforated, neat cancelled \"TSINGTAU 16.5.11. \". A colonial rarity, of the only a few copies became known are. Due to missing offers also in the Michel special catalogue only noted without price. Photo expertize \"faultless condition\" Jäschke-Lantelme BPP. 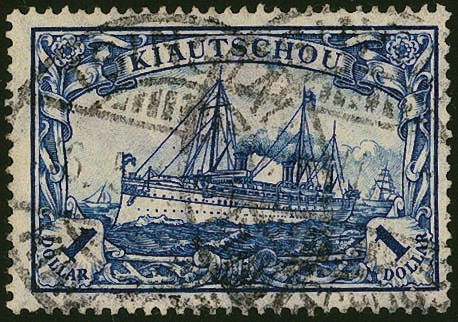 5282 ⊙ 35PFI 1 Dollar imperial yacht with scarce plate flaw \"numeral of value 1 crosswise hatched\", neat cancelled Michel 600,- €. 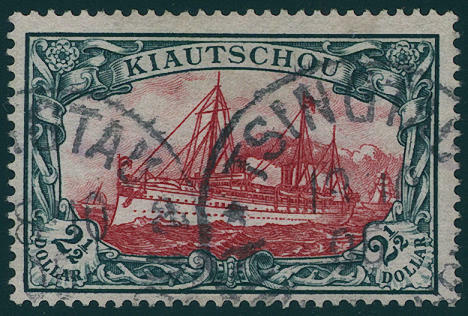 5283 ∆ 37A 2 ½ Dollar imperial yacht watermarked, wonderful left upper corner of the sheet on magnificent white letter piece, twice neat cancelled \"TSINGTAU KIAUTSCHOU 8.6.11. \". An outstanding quality for the highest standards! Photo expertize Dr. Steuer VB. 5284 ✉ 37IA 2 ½ Dollar green black / dark carmine, peace printing, 26:17 perforation holes, fresh colors and very well perforated on very nice registered cover with two clearly single circle postmark \"TSINGTAU KIAUTSCHOU 10.3.10. 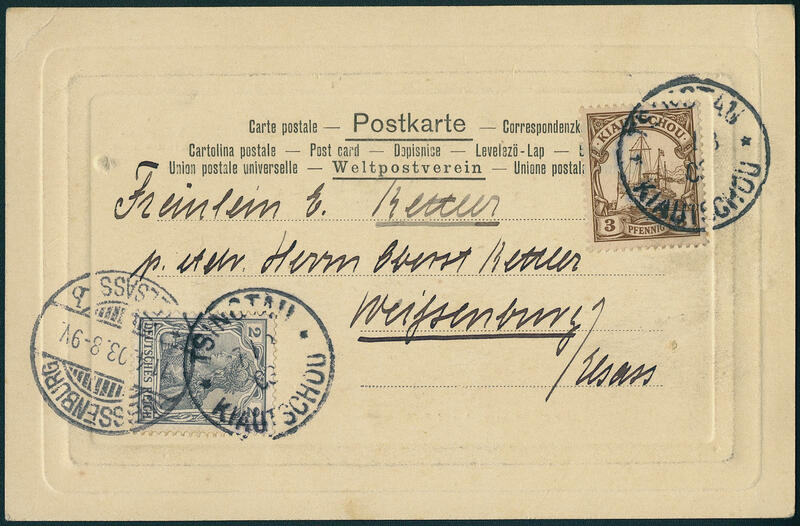 \" to Friedenau / Berlin with arrival postmark. An especially nice cover of the top value! Signed Thier. German Colonies Marshall Islands British. Bes.\Dt.kol.marshall-inseln-brit.bes. 5306 ✉ 46,47 5 Pfg. Green, 2 vertical pairs, of it of a from the corner of the sheet and 10 Pfg. 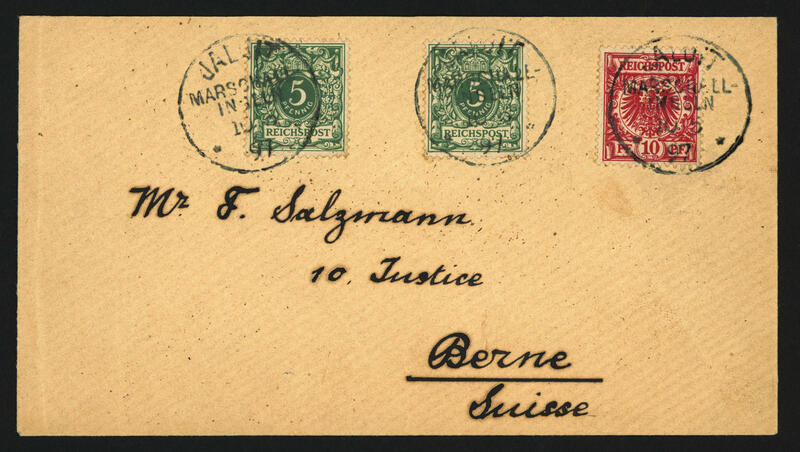 Red on beautiful registered cover from \"JALUIT marshal islands 28.5.97\" to Baden-Baden and forwarded to Switzerland with transit cancellation and arrival postmark. One of the rarest forerunner covers of this area. 5307 ✉ 46c,47d 5 Pfg. Bluish green and 10 Pfg. Red, right above round corner, as lovely having bright colors franking on beautiful cover with rare colour cancellation in greenish-blue from \"JALUIT marshal islands 10.5.97\" to Bern with arrival postmark. Important forerunner rarity. Photo expertize Dr. Steuer BPP. 5308 ✉ 48b 20 Pfg. 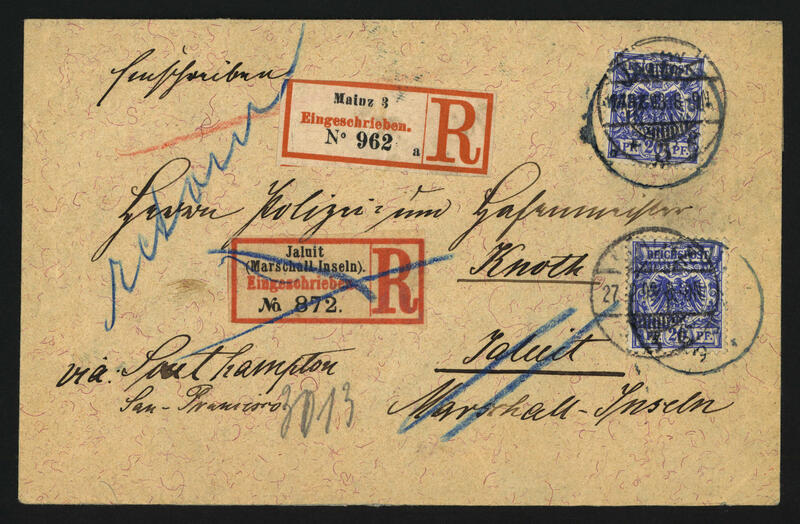 Blue, in perfect condition as a single franking on requires moderately used cover from \"JALUIT marshal islands 15.7.94\" to Mr. Dr. Wettner, museum for natural healing Berlin with arrival postmark and reverse transit cancellation from San Francisco. Mr. Dr. Wettner was at that time a known botanist. Very rare, expertized from Willmann. 5309 ✉ 48d 20 Pfg. 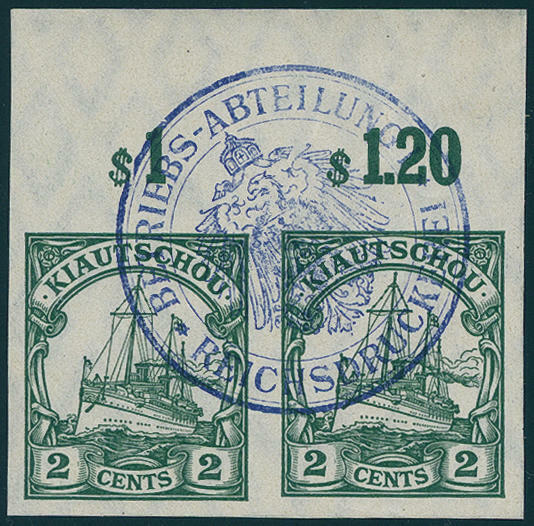 Violet ultramarine, two pieces on correctly franked registered cover from \"MAINZ 27.12.98\" to Jaluit / marshal islands, there returned with greenish blue stamp \"JALUIT 20.3.99\" and appropriate registration label to Mainz with arrival postmark. There are only very few letters the precursor time have become known, the again returned are. In this combination probable unique! Photo expertize Jäschke-Lantelme BPP.